Cargo pilot turned jet-pack jockey William Grey finds himself teaming up with Nikola Tesla to save humanity from aliens and fascism after crashing in the Bermuda Triangle in Capcom's sci-fi shooter Dark Void. But it's not the unlikely plot that is the biggest selling point for Capcom's new franchise, it's the developer's game lineage. Dark Void is the work of many of the same people who worked on spectacular Xbox dog-fighter Crimson Skies, and that shows in the game's interesting approach to aerial and ground combat, and how the two blend. Dark Void also brings with it an evolution on the cover system, allowing gamers to take vertical cover as they fly, hop and hover up, down and around the scenery. But can a dash of innovation make a game? Let's see. Tight Controls: Before a game can wow with innovation it has to nail the basics of its genre. Dark Void has surprisingly tight controls for a game that allows you get into ground firefights, hop and hover over terrain while shooting and take to the air for intense dog fighting. The sheer scope of Dark Void's combat is impressive, but the fact that the game's controls are flexible enough to not only make them all fun, but make shifting from one to the other effortless, is quite a feat. Hover: Fairly early into the game you're given a prototype jet pack that allows you to hop and hover around the terrain. The redesigned controls for this system works sort of like a double jump, but allows you to drift around the space and even move up a bit. The game perfectly balances the need to allow gamers to use this ability to get the drop on enemies from the sky, with a depleting gauge that limits the ability's use. Being able to run into a firefight and take out enemies using traditional cover is fun, but then being able to blast 20 or so feet into the air and take enemies out from the sky is a powerfully rewarding experience that changes the dynamics of every engagement. And it changes it even more once your enemies gain the same ability. Flight: Not too long after getting your jetpack, it's upgraded to allow you to shift from a dangling hover to jet flight. Shifting from one to the other requires a double button push and a results in a few seconds of deliberate disorientation, but unless you're in a very tight space you should survive the transition. Once airborne, your jet pack handles like a dream, allowing you to zip around and through terrain, execute a limited number of stunts and pound ground and air targets with the pack's built-in machine guns. You can, at anytime, also shift back to hover or free fall. The blending of these two modes makes above ground moments of the flight a joy to play. Vertical Combat: Flight is great and hover adds a new element of strategy to firefights, but vertical combat is Dark Void's real game changer. Many of the interior areas of the game, and some of the cliffs, allow you to shift cover from standard hide-behind-something-substantive mode to either dangling or laying down across platforms or rock. Once you enter this mode your perspective automatically shifts, giving you a better view of everything above or below you. Then you duck and cover like any cover system, but can also typically leap back up onto the platform you're clinging to or drop down or hop up to the next platform. This extra dimension of cover is the sort of thing, once experienced, you'll miss from all relevant games. Watch Your Step: I'm a guy wearing a jet pack, but somehow when I fall, when I fail to sky-jack a spaceship, when I screw a landing, I plummet to my death? How's that work again? I mean, couldn't I just use that giant jet pack to fly to safety? No, apparently not. Boxed in Canyons: The dogfights of Dark Void are a pleasure to experience, you zip through canyons exchanging fire with flying saucers, sometimes hopping on to one to take control. But outside the main bubble of action and you'll quickly bump into an invisible wall that flips you around and send you shooting back into the action. It's bad enough that Dark Void falls back on the inexcusable invisible wall to box you in during flight, but those walls are almost uncomfortably too close in the larger battles. Chugging, Chugging, Chugging: Air battles aren't just subjected to invisible walls, they're also the only time when the game seems to choke on all of those marvelous graphics, physics and flight. 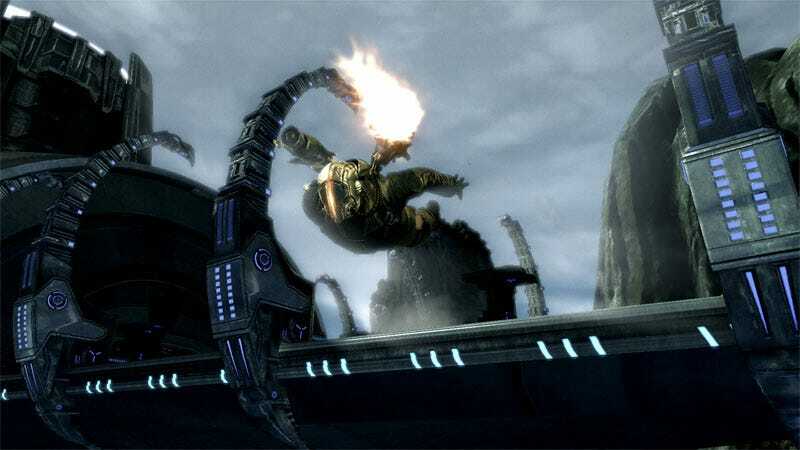 The Xbox 360 version of the game seemed to actually hold back the full force of flying saucers during combat, only allowing them to pop up or fly in once you've cleared the screen. I suspect this occasional chug may be why. Cut the Cut Scenes: I'm generally a big fan of game stories, but I wasn't a big fan of Dark Void's plot. It introduced too many elements, not giving any of them enough attention to explain just what they meant or how they all fit together. The characters suffer from the same plight. There's an attempt at chemistry between the male and female leads, but it never really delivers and the rest of the characters are more plot devices than people you care about. I want more of this game with its aerial combat, its seamless transitions from ground to hover and flight all while allowing you to gun down enemies, its vertical combat. But next time around it needs to deliver a more meaningful plot, better settings, a more cohesive package. Dark Void has some incredible design elements. It does an incredible job of blending air, hover and ground firefights into a single, easy-to-control, fun-to-play package. And it delivers a fun new mechanic. That's a lot, but I'm not sure it's really enough to deliver the sort of experience gamers are looking for when they drop the cash for a big PC, PlayStation 3 or Xbox 360 title. Dark Void was developed by Airtight Games and published by Capcom for the PC, PlayStation 3 and Xbox 360 on Jan. 19. Retails for $59.95 USD. A copy of the game was given to us by the publisher for reviewing purposes. Played through the entire single-player campaign on the Xbox 360.